I’ve been battling a migraine today, so I thought I would write about two very tranquil books that I think are fantastic. 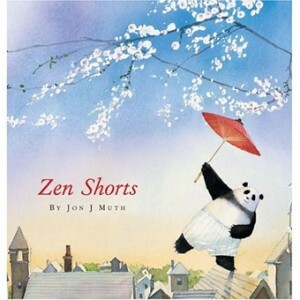 Zen Shorts and Zen Ties by Jon J Muth. Zen Shorts was a Caldecott Honor Book in 2006 (I would have voted for it to win over The Hello, Goodbye Window but that’s another story). I love Stillwater the Panda and the Buddhist stories he tells three young siblings. 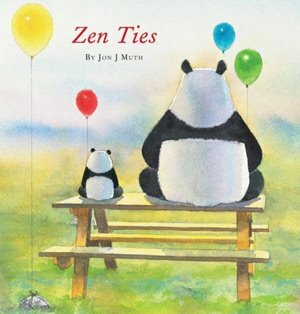 It’s an incredibly soothing book about forgiveness, luck, and hospitality. I don’t know if very small children will understand all the lessons, but the pace, tone, and illustrations still make for a nice calming story when trying to bring little ones down from the rafters. Zen Ties continues the Buddhist tradition, this time with a visit from Stillwater’s nephew Koo (as in, “Hi, Koo”) who speaks in haikus. The three siblings from the first book join Stillwater and Koo for a summer spent learning to like the mean elderly lady down the street, who of course turns out to be pretty nice in the end and just in need of friends. This was just released a few months ago to great praise (just like the first book). I wonder if this will be a contender for the Caldecott this year. I think it’s wonderful. There. Three attempts at finishing this post and I managed. Back to hiding under covers until the next wave of headache passes. Happy Monday!